The twentieth century has been characterised by the proliferation of human rights in the discursive practices of the United Nations (Baxi, 1997). In this article, we explore the continual process of rights-based education towards transformative action, and an open and democratic society, as dependent upon the facilitation of human rights literacy in teacher training. Our theoretical framework examines the continual process of moving towards an open and democratic society through the facilitation of human rights literacy, rights-based education and transformative action. We focus specifically on understandings of dignity, equality and freedom, as both rights (legal claims) and values (moral action) across horizontal and vertical applications, considering the internalisation and implementation of dignity, equality and freedom towards transformative action. Our analysis of data stemming from a project funded by the National Research Foundation (NRF) entitled 'Human Rights Literacy: A quest for meaning', brought student-teachers' understandings into conversation with the proposed theoretical framework. In terms of understandings related to dignity, equality and freedom, participants seemingly understand human rights either as legal interests, or alternatively, as they pertain to values such as caring, ubuntu, respect, human dignity and equality. Legal understandings primarily focus on the vertical application of the Bill of Rights (RSA, 1996a) and the role of government in this regard, whereas understandings related to the realisation of values tended to focus on the horizontal applications of particularly dignity and equality as the product of the relation between self and other. We conclude the article by linking the analysis and the theoretical framework to education as a humanising practice within human rights as a common language of humanity. In so doing, we argue that human rights literacy and rights-based education transcend knowledge about human rights, moving towards transformative action and caring educational relations premised on freedom, dignity and equality. Finally, recommendations are made regarding human rights and rights-based education as transformative action within the South African context, towards an open and democratic society. The twentieth century has been characterised by the proliferation of human rights in the discursive praxis of the United Nations (UN) (Baxi, 1997). At the Vienna Conference on Human Rights (1993), the UN secretary-general posed that human rights constitute a "common language of humanity" (in Baxi, 1997:142). The Constitution of the Republic of South Africa (RSA, 1996a, hereafter The SA Constitution) entrenched dignity, freedom and equality as the foundation of a democratic state, which protects the fundamental rights and freedoms of its people. In order to translate human rights into classroom and school management praxis, the South African Department of Education (DoE) published the Implementation Guidelines for Safe and Caring Child-friendly Schools in South Africa (Department of Education & [United Nations Children's Fund] UNICEF South Africa, 2008 - hereafter Implementation Guidelines). According to the Implementation Guidelines, a rights-based school "demonstrates, promotes, and helps monitor the rights and wellbeing of all children" (Department of Education & UNICEF South Africa, 2008:7). The implementation of human rights and the internalisation of human rights values in schools and in teaching-learning are crucial to sustaining human rights and social justice in a transformative democracy. We begin by examining the continual process of moving towards an open and democratic society through the facilitation of human rights literacy in teacher training, rights-based education and transformative action from a theoretical perspective. In so doing, we focus specifically on understanding dignity, equality and freedom as both rights (legal claims) and values (moral action) within horizontal and vertical applications, considering the internalisation and implementation of dignity, equality and freedom towards transformative action. Our data analysis explores the data in terms of student teachers' understandings of dignity, freedom and equality, and we link the conclusions from our analysis and the theoretical framework to education as a humanising practice within human rights as a common language of humanity. To conclude, we make recommendations concerning human rights and rights-based education as transformative action within the South African context. Human rights as the "common language of humanity" (in Baxi, 1997:142) are embraced as educational aims in numerous global human rights treaties since 1948. In terms of the Convention on the Rights of the Child (UN, 1989), the aims of education, in addition to personal development, involve strengthening a respect for human rights and freedoms, enabling individuals to participate effectively in a free society, and promoting understanding, friendship and tolerance. Working from within a framework for the realisation of children's rights to education and rights within education, the UNICEF and United Nations Educational, Scientific and Cultural Organisation (UNESCO) recommend a "human rights-based approach to education" (UNICEF/UNESCO, 2007:7-9), rooted in principles such as equality and non-discrimination, participation and inclusion, empowerment, accountability and respect for the rule of law. A rights-based approach to education is informed by human rights norms and standards. Such an approach aims, inter alia, to contribute to positive social transformation and social cohesionin and through education (UNICEF/UNESCO, 2007). The 1993 UNESCO Montreal Declaration states that education (and rights-based education) "should aim to nurture democratic values, sustain impulses for democratization [sic] and promote societal transformation based upon human rights and democracy" (UNESCO, 1993:1). In keeping with international principles of a rights-based approach to education, the DoE published the Implementation Guidelines (Department of Education & UNICEF South Africa, 2008), which aim at translating rights into classroom and school management praxis. These guidelines define rights-based education within a holistic approach to quality education and are rooted in The SA Constitution (RSA, 1996a) and the Convention on the Rights of the Child (UN, 1989). Rights-based education in a transformative democracy relies on the implementation of human rights and the internalisation of human rights values in schools, and in teaching-learning. Section 7 of the South African Constitution describes the Bill of Rights as "a cornerstone of democracy" and provides, together with Section 1, inter alia, the values of dignity, equality and freedom as a framework for building an open and democratic society (Currie & De Waal, 2013:6-7). Thus, rights-based education should be premised on these values. Rights-based education and the implementation and internalisation of human rights and human rights values are, however, not static; rather, these are on-going processes of moving towards the realisation of human rights and democracy within a transformative society. This understanding echoes Gordimer's (2011:501) view, that "democracy is not an on-off affair; it has to be learned, day by day." We therefore view an "open and democratic society" (RSA, 1996a, preamble, Sections 36 and 39) not as a static end-point but rather as a process involving continual becoming as human rights are learnt and human rights values are internalised day by day. Teachers play an important role in the facilitation of rights-based education towards transformative action, premised on human rights and democracy. It is incumbent upon them to facilitate the development of a sense of respect and responsibility towards others, to inspire learners to uphold human rights, and to promote democratic values and practices in schools (RSA, DoE, 2000). Being responsible for the dignity, equality and freedom of others in a classroom requires both teacher and child to always be "one-caring or one cared-for" (Noddings, 2007:372). The dignity and equal worth of all others are realised in the reception of the other as a subject in a caring relation within the teaching-learning context (Noddings, 2007). South Africa's Promotion of Equality and Prevention of Unfair Discrimination Act (RSA, 2000) echoes the ideal of a caring society, where it states in the preamble that "this Act endeavours to facilitate the transition to a democratic society, united in its diversity, marked by human relations that are caring and compassionate". For this reason, it is imperative that teacher training facilitates the acquisition of human rights literacy, manifesting as rights-based education within caring educational relations. For the purpose of this article, we define human rights literacy as transcending knowledge about human rights towards understandings of the processes of human rights and implications thereof in an educational context (Roux, 2010). Against the background of the above discussion, we illustrate the continual process of rights-based education towards transformative action in the diagram below (Figure 1), as dependent upon the facilitation of human rights literacy in teacher training. Human rights literacy, the implementation of human rights and internalisation of human rights values and rights-based education, are essential components of education as a humanising practice within caring educational relationships. In turn, such education could facilitate transformative action towards an open and democratic society, based on human rights, which may be marked by caring and compassionate human relations. An open and democratic society is viewed not as a static end-point, but as one of the components in a cycle of continually moving towards an open and democratic society through human rights literacy and transformative action - teaching-learning democracy day by day. The most basic of all rights is the right to be human, and to remain human (Baxi, 1997). Our analyses and critique of data from this project are framed within the theoretical paradigm as proposed by Freire (1993), where the conceptualisation of education as a humanising practice of freedom is concerned. Given Freire's (1993:25) conceptualisation of pedagogy and education, humanising and democracy are central concerns, where the author notes that, "while the problem of humanising has always, from an axiological point of view, been humankind's central problem, it now takes on the character of an inescapable concern." The critical theory paradigm (the conceptualisation of the emancipatory role of education) developed during the late 1920s with the Frankfurt School. Although there are many lines of thought in critical theory, all have a re-appropriation of classical Marxism in common. Critical theorists are informed by ethical concerns and a critical stance towards society. Critical theory research continually critiques conceptions of humanity and humanising from the positions of the oppressed and marginalised within societal and educational contexts (Becker, 2013; Blake & Masschelein, 2003). At its very heart, the paradigm is an ideological one of emancipation and transformation (Ponterotto, 2005). Values are understood as ideals we share about what is good, important and desirable in life, and serve as guidelines for our actions and attitudes (Longman Dictionary of Contemporary English, 2003). As values, dignity, equality and freedom represent ideals about a good life, or a society. Arguing that all persons are of equal moral worth, the ideal of a democratic society implies that all persons should collectively decide what they regard as the good life, and which rules should guide action towards the realisation of such a good life (Young, 1990). Such ideals are described in the preamble to The South African Constitution (RSA, 1996a) as "a democratic and open society" and include the aims of both improving "the quality of life of all citizens" and freeing "the potential of each person". The South African Constitution (RSA, 1996a) outlines the values that underpin the South African republic and society as, inter alia, "human dignity, the achievement of equality and the advancement of human rights and freedoms" (Section 1(a)). Section 7(1) highlights dignity, equality and freedom specifically as "democratic values", which are affirmed by the Bill of Rights. These values steer legislation, as well as its interpretation and implementation, and place a duty on government to respect, protect and promote the values in both vertical and horizontal applications (Sections 1, 7, 36 and 39). Dignity, equality and freedom are, as Yacoob (2014) puts it, meant to transform our society from one in which only the fittest survive, to one in which we "care for and empower vulnerable people".i Within the South African socio-historic context, the Constitution (RSA, 1996a) explicitly acknowledges that freedom, dignity and equality should be realised within protected socio-economic rights (Cameron, 2014). For the sake of furthering the realisation of the values of dignity, equality and freedom, The South African Constitution (RSA, 1996a) incorporated these values as human rights. In so doing, it (RSA, 1996a) provides principles and norms to measure right and wrong and enforces the realisation of the values it promotes and enshrines (Nieuwenhuis, 2007a). Rights are "legally enforceable interests that warrants protection by means of a legal remedy or sanction" (Smit, 2013:45), and the legal system has the duty to ensure that people enjoy these rights (Nieuwenhuis, 2007a). The values of dignity, equality and freedom should thus be understood not only as ideals and guidelines (values) but also as protected interests or legal claims (rights). For this reason, The SA Constitution (RSA, 1996a) protects the rights to equality (Section 9), dignity (Section 10) and specific freedoms (Section 12, 15, 16, 18, 21 and 22). The preamble to the Universal Declaration of Human Rights (UN, 1948) holds the recognition of inherent dignity, as well as the equal and in-alienable rights of all members of the human family as the foundations of freedom, justice and peace in the world. Consequently, only where equality and dignity are achieved, will individuals and groups be able to claim their freedoms. On the other hand, the realisation of freedom is necessary for dignity and equality to be achieved. Dignity, equality and freedom (as rights and values) work reciprocally and are linked to one another in the sense that the protection of each is essential for the realisation of the other. The enforcement and implementation of rights are in the hands of national governments (Donnely, 2007), having both vertical and horizontal applications. The Department of Basic Education (DoBE), as an organ of state, promulgated and implemented several South African educational laws and policies.ii However, Nkonyane (2014) holds that despite laws and policies to protect rights and promote social justice, South Africa remains one of the most unequal societies in the world, with high levels of poverty. Furthermore, according to Sou-dien (2010), it seems that the post-apartheid curriculum perpetuates historic patterns of discrimination and reinforcing the marginalisation of poor children in South Africa. Countering the inequality and injustices in post-apartheid South Africa would require that the interpretation and application of laws be aligned with "the values that underlie an open and democratic society based on human dignity, equality and freedom" (RSA, 1996a, Section 39(1)), enabling the Constitution "to continue to play a creative and dynamic role in the expression and achievement of the ideals and aspirations of the nation" (S v. Mhlungu 1995 (3) SA 391 (CC)). Whereas, the interpretation and implementation of human rights encompass interaction between different rights, and between individual and collective rights, having an understanding of how the values of dignity, equality and freedom underpin such interpretations and implementations, could impact the holistic interpretation of rights and the balance of power and sovereignty in societal and political relations (Mihr, 2009). Recognising a right to dignity is an acknowledgement of the intrinsic worth of human beings: human beings are entitled to be treated as worthy of respect and concern. This right therefore is the foundation of many other rights that are specifically entrenched. In terms of Section 10 of the Constitution (RSA, 1996a), everyone has "inherent dignity and the right to have their dignity respected and protected". As a right (legal claim), dignity places an imperative on government and organs of state, such as departments of education and schools, to respect each person and to protect that person's dignity (vertical application) (Currie & De Waal, 2013). It is also horizontally applicable, where all persons (natural and juristic) should respect the dignity of every person. An understanding that all people have human dignity to the same extent, invites equal respect for all (Currie & De Waal, 2013; Smit, 2013), which highlights the interaction and interdependence between dignity and equality. Currie and De Waal (2013) succinctly describe equality as the idea that people who are similarly situated in relevant ways, ought to be treated similarly. The interrelatedness between dignity and equality has been highlighted by the Constitutional Court on more than one occasion, where it has defined unfair discrimination as "treating persons differently in a way which impairs their fundamental dignity as human beings, who are inherently equal in dignity" (Prinsloo v. Van der Linde 1997 (3) SA 1012 (CC)). This interrelatedness also came to the fore in The President of the Republic of South Africa v. Hugo 1997 (4) SA 1 (CC) para 41. According to Albertyn and Goldblatt (1998), equality as a value gives power to the vision of the Constitution (RSA, 1996a), while equality as a right supplies the means by which this is be achieved. The right to equality, in terms of Section 9 of the Constitution (RSA, 1996a), poses an imperative implementation of (the value of) equality and expressly enacts both vertical and horizontal application. Section 9 offers a guarantee that the law will protect and benefit people equally, and prohibits unfair discrimination. This section is intended to protect, inter alia, vulnerable gender, race, ethnic, religious, cultural, linguistic, social, abled and age groups from unfair discrimination (Yacoob, 2014). Understanding the value of equality calls for the implementation of substantive equality, rather than formal equality, taking the result or outcomes of a particular provision or application into account, so as to determine whether equality has been achieved (Currie & De Waal, 2013). Just as dignity and equality are inextricably linked, both also have a direct bearing on freedom. Dignity and equality both contribute to the realisation of freedom, while freedom in turn is a prerequisite in a democracy, without which a culture of human rights would not flourish, and where dignity and equality would not be able to be realised. Freedom is described as the supreme value of liberalism and defined as having the ability to make choices for oneself, being autonomous, or being free from constraint (Law, 2007). Thus, freedom is viewed as an intrinsic part of all human beings, whose dignity would be violated should it be limited. When the freedom of some is limited to a greater extent than the freedom of others, equality is violated and inequality perpetuated. For this reason, freedom has been incorporated into the Bill of Rights as different rights: freedom of the person (Section 12); religion, conscience, thought and belief (Section 15); expression (Section 16); association (Section 18); movement and residence (Section 21); and trade, occupation and profession (Section 22). These rights provide enforceable implementation of (the value of) freedom pertaining to specific aspects of human life. The values of dignity, equality and freedom compel us to take responsibility for becoming an open and democratic society based on dignity, equality and freedom. In addition, as enforceable rights, the rights to dignity, equality and freedom provide a guarantee for the protection and enforcement of the values that underpin these rights. Human rights literacy, described as understandings of dignity, equality and freedom as both values and as enforceable rights could, therefore, enable and empower departments of education, education institutions and educators to internalise and implement human rights and human rights values in schools and in teaching-learning. The continual process of becoming, of moving towards an open and democratic society through rights-based education and transformative action, is dependent upon the facilitation of human rights literacy in teacher training. Within the broader project of which this article forms part, the research team explored what human rights literacy entails and aimed to establish and develop improved transformative curriculum and teaching-learning approaches (Roux & Du Preez, 2013). The project group collected qualitative and quantitative research data by means of three different collection processes: a walk-about, a survey, and small focus-group discussions (Becker, De Wet & Parker, 2014). This article draws from the focus-group data only. A total of 80 students participated in the walkabout. Using convenience sampling, the walkabout was conducted on three university campuses to explore the domain and inform possible questions for the survey. A total of 1,086 students (551 first-years and 535 fourth-years) participated in the survey, during which they could indicate whether they were willing to participate in focus-group discussions that followed on the survey. Small focus-group discussions were conducted on the six sites to validate data from the previous two collection strategies and to re-evaluate literature, ontologies and epistemologies. Using a snowball sampling strategy, we invited students on each of the six survey sites, who had indicated their willingness to participate in focus groups during the survey. Some of these students, in turn, invited other B.Ed students from their year-groups who voluntarily joined the discussions. Smaller groups (three to nine) were preferred due to the complex nature of the discussion topics. A total of 68 students participated in focus groups, of whom 29 were first-year and 39 were fourth-year students. Twenty-seven of the focus-group participants were male (14 first-years and 13 fourth-years), and 41 were female (15 first-years and 26 fourth-years). Participants were between 18 and 28 years old and spoke six of the 11 official South African languages. The majority were Christian, while three participants indicated that they were Muslim. Small focus-group discussions were conducted to elicit dialogue about human rights, probe participants' conceptions and ontology and disrupt fixed meanings and understandings (Becker et al., 2014; Roux & Du Preez, 2013). Focus groups allowed researchers and participants to meet face-to-face in mostly unstructured conversation and dialogue that supported the flow and development of conversation, encouraged debate and conflict, and inspired participants to discuss human rights with one another, rather than with the researchers only (Becker et al., 2014; Creswell, 2009; Nieuwenhuis, 2007b). Six of the researchers in the research team visited different sites in pairs and conducted a total of 21focus-groupsessions, with 13 different groups of students. Seven of the groups met twice, five met only once, and one group (S6Y1) met three times. Separate focus-group discussions were conducted with first-years and fourth-years, except for one meeting (S6Y1&4M2) on Site 6, which combined first- and fourth-years. Discussions were prompted by the question: 'do human rights exist?' Conversation flowed easily, with researchers probing further issues as they arose. In follow-up meetings, discussions were initiated by means of pre-selected scenarios. Four different scenarios drafted by the research team sketched fictitious events regarding diverse socio-cultural, gender and religious contexts, including possible human rights violations within an educational context. After reading the scenarios, participants responded to these in the order they chose, and without any specific probing by researchers. To uphold ethical protocol in accordance with the hosting universities' policies, we liaised with relevant gatekeepers and stakeholders for permission to conduct research on the respective sites. We took care to uphold the dignity and privacy of our voluntary participants while gathering the data, and also in data management, analysis and dissemination practices. The data used for this article includes the spoken text from focus-group discussions, which were audio-recorded and transcribed verbatim. For the purpose of this article, the authors analysed the data by means of discourse analyses, which provide the possibilities for exploring social interaction in relation to understandings of dignity, equality and freedom (see Leech & Onwuegbuzie, 2008). The focus-group data was firstly read as a whole, after which words and patterns of speech were selected and analysed in order to determine understandings and applications. Data was allowed to crystallise as it was brought into conversation with and examined in relation to our theoretical framework on dignity, equality and freedom as moral relations (values) and legal claims (rights) within vertical and horizontal applications. All data excerpts are quoted verbatim. The reference style for these quotes is as follows: S1Y2M1, where S refers to the site number (1 to 6), Y refers to the year group (first- or fourth-years) and M refers to the meeting number of a specific group (first or second meeting). In this section, we use a selection of the focus-group data to illustrate participants' understandings of dignity, equality and freedom and the social interaction resulting from it. Our analyses focus primarily on understandings of student teachers related to dignity, freedom and equality as internalised values (moral action) and as legal interests (rights) embedded in contexts characterised by power relations, poverty and marginalisation. We consider how human rights understandings are influenced and shaped by power relations and injustice, while examining how the understandings of student-teachers reflect and influence inter-nalisation and implementation of human rights and human rights values in vertical and horizontal applications. Patterns of speech pointing to discourses on human rights as a legal construct and its vertical implementation included phrases and words such as constitution, bills and laws: "[Human rights exist] because we have a Constitution" (S2Y1M1) and " a human rights bill, a set of laws that tell you what human rights are" (S4Y4M1). Students see the role of the law as protecting the rights of humans, where, as one student said ".. .the law, it protects us and everyone..." (S3Y1M1), while another noted, ". the law is the thing that surrounds human rights and helps it..." (S4Y4M1) [sic]. From this perspective, the implementation of rights is understood as a function of and the responsibility of government, which has the power and authority to do so (S4Y4aM1; S5Y1M1; S6Y4M1). Everyone is so focused on: 'human rights, human rights, human rights'. No one says anything about responsibilities. I can have all the rights, but it is my responsibility to treat you fairly and to consider your rights as well. Everything is about: 'me, me, me', but I think, what can I do? How can I treat you fairly so that we are equal? (S4Y4M1 a). ...that compassion you have - that ubuntu in you - it supersedes everything, because you are acting in compassion to another human being, protecting their rights. Even if it is against the law. (S1Y4M1) [sic]. Students from the group S1Y4M1 used phrases such as "when you do not only think of yourself. ", "caring for another person", "sharing things", "compassion to another human being" and "helping others", which illustrate their understandings of human rights as a form of moral action. Personal responsibility towards the other, and specifically the marginalised other, is manifest as internalised values in a horizontal application, in which the dignity, equality and freedom of the other are primary concerns. This seems to be underpinned by understandings of human dignity and equality within a common human ontology: ". they are human. They need to be protected by human rights" (S1Y4M1). Students argued that human rights need "a well-built foundation for us to step on [sic] and say, 'this is [these are] our rights, we are responsible for this'" (S5Y1M1).v A different group also referred to a 'foundation' and defined it as follows: "... Um, I think if we can start at the foundation, I mean -go all the way back to the morals, I mean - people with good values become good people." (S6Y4M1) [sic]. These students seem to understand the interaction between legal interests and moral action, since dignity, equality and freedom are viewed as both values and rights. I think when you talk about respect, it is when you respect the human dignity of someone. I think it is when you respect what he or she is doing; what he or she is willing to achieve in future [sic]. You can't respect a street kid although he or she deserves your respect. You can't just give respect.if you do something, you deserve respect.so respect, I will say, is all about the human dignity and respecting.myself and respecting each other (S1Y1aM1). The above indicates horizontal applications of the right to dignity in the light of the (non)internali-sation of dignity as a human rights value. It indicates that although the student knows everyone "deserves your respect" (knowledge), this realisation is not internalised as a normative concept to such an extent that the human dignity of every person is indeed respected (internalisation and implementation). Discourse around socio-economic inequality emphasised the relation between power, authority, money and the non-realisation of human rights. Phrases pointing to socio-economic inequality included power, money, monetary basis, powerless, scared. The data seems to indicate that participants understand inequality as a result of people with authority or power, violating and abusing human rights. Examples were given of lecturers and campus authorities violating students' rights (s4y4am1; s4y4bm1), police violating the rights of the people (s2y1m1) and government officials abusing their positions (s4y4am1). Freedom of speech, the greatest...I almost said something rude; it is one of the things that [is] contradicted the most. Because they say it is your freedom of speech, but the moment you say something they are out to get you (S3Y4M2) [sic].ix Freedom of expression...is it freedom of expression of everything you want to express, or is it only what would be preferable for other people? (S4Y4M2). Data analyses focused on the different ways in which student teachers understand dignity, freedom and equality as internalised values and as legal interests within horizontal and vertical applications, and how their understandings are shaped and influenced by power relations, inequality and injustice. In terms of understandings related to dignity, equality and freedom as both legal interests (rights) and values (moral action), participants either understand human rights as legal interests, or, in relation to values such as caring, ubuntu, respect, human dignity and equality. However, student-teachers who focused more on dignity, equality and freedom as values or moral constructs, were also more inclined to view human rights as legal constructs, whereas those who emphasised a legal understanding were less inclined to include references to moral action. Understandings related to dignity, equality and freedom as legal claims primarily focused on the vertical implementation and the role of government in this regard. From this perspective, government and state organs are responsible for the realisation and implementation of human rights. Understandings relating to the internalisation of these rights as values manifesting within horizontal, interpersonal relations mainly focused on dignity and equality. Student teachers relate dignity and equality to the values of respect, care, compassion and responsibility. Within this view, focus is placed on the role of human rights as internalised values within horizontal interpersonal applications. It appears that the internalisation of the values of dignity and equality leading to the implementation of the right to dignity and equality, is supported by student teachers' understanding of a common human ontology. Understandings of dignity and equality as internalised moral values would contribute to rights-based education as a continual, unconditional reception of others within caring and compassionate relations (see Noddings, 2007). These understandings focus on specific, (inter)personal and concrete experiences of human rights within teaching and learning contexts, towards transformative action and humanising practices. It transcends knowledge of rights as laws and legal claims towards solidarity and caring (moral action). Our findings further indicate that student teachers understand the interrelatedness of equality and dignity in terms of the socio-economic (non)-realisation of rights. Participants in this study expressed feelings of powerlessness. This revealed how class, money and position within the South African context influence implementation and in-ternalisation of human rights and human rights values, and how this manifests in horizontal and vertical applications. The realities of the South African context were emphasised during discussions on equality/inequality and dignity. Student teachers seem to understand dignity, equality and freedom against the background of the money/power-agency relation, highlighting socioeconomic inequalities, and the resultant loss of dignity. Socio-economic inequality and the resultant loss of dignity and (non)realisation of rights influence the understandings and applications of human rights as both rights and values in vertical and horizontal applications: although student-teachers understand dignity, equality and freedom within a common human ontology, power relations and injustice influence interpersonal relations and disrupt understandings of dignity, equality and freedom. Dignity is equated to 'good' human action, equality is influenced by power and money, and freedom of speech and expression are limited to "what would be preferable for other people" (S4y4M2). This indicates understandings that equality, dignity and freedom are only applicable to those who meet certain requirements or norms, be these social or moral; or only amongst those who have power and money. Our findings in this regard correlate strongly with what Freire (1993:40) described as the perception that "having" is a condition of "being", a worldview which could have devastating consequences for the continual movement towards rights-based education, transformative action and open and democratic societies. The influence thereof on relations with different others (who do not possess equal power or money) will inevitably result in marginalisation. The facilitation of human rights literacy towards the continual process of becoming an open and democratic society is, therefore, even more important. As students gain informed understandings of dignity, equality and freedom as rights and values, marginalisation - as a social construction reflecting power relations -needs to be questioned critically as a dehumanising practice (Dale & Hyslop-Margison, 2010). Student teachers need to understand that the representation of others (or themselves) as "less human" is "partial, interested and potentially oppressive" (Elssworth, 1989:324). There are many variants within human rights education that may and ought to influence human rights literacy and the movement towards rights-based education and transformative action. Most scholars agree that human rights education, enabling human rights literacy, should include both the content and the processes related to human rights (Bajaj, 2011; Roux, 2010). Although many approaches to human rights education focus on a universal and global stance to human rights in education and rights-based education, scholars have recently also turned towards distinguishing human rights approaches in education from the global towards the local. Different societies, and particular contexts, result in a difference in emphasis on a given set of rights, such as socio-economic rights and/or political and civil rights (Bajaj, 2011). Our findings from this project clearly indicate a need to focus on socio-economic rights and social and restorative justice in the South African context. To this end, Heyns (2006:3) argues that human rights should be understood in terms of a "struggle approach". This approach emphasises experiences of injustice (such as the non-realisation of socioeconomic rights) as the starting point of understanding human rights or, in the context of our article, understanding dignity, equality and freedom. Following a 'struggle approach' to rights-based education therefore, would require addressing the need for the realisation of socio-economic rights, social justice and restoration within the South African education context. We argue that a suitable approach for facilitating human rights literacy in the South African context would be Human Rights Education for Transformative Action (Bajaj, 2011). Such an approach would focus on radical action towards inclusion, social justice and restoration, revealing elements of critical theory. It correlates with the conception of human rights as the aspirations of the oppressed and aids understandings of human rights within a "struggle approach" (Bajaj, 2011; Dem-bour, 2010; Heyns, 2006:3). 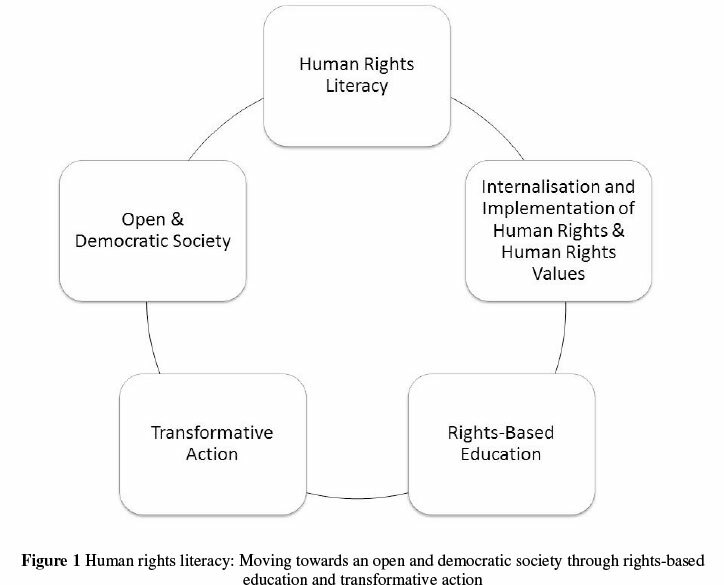 Thus, we argue that following a Human Rights Education for Transformative Action approach facilitates human rights literacy and emphasises the processes and consequences of human rights implemented both vertically and horizontally, as well as the internalisation of human rights and human rights values. The approach requires an analysis of historical and present conditions, the gap between the guarantee of human rights and realities, and actual power relations that sustain this gap. Such an approach would advocate for collective action in society, schools and the classroom. It requires teachers to enact responsibility for the freedom, dignity and equality of all the children in a classroom through caring and humanising practices and would become possible when human agency and solidarity within open and democratic societies are actively promoted (Bajaj, 2011). In focusing on specific, personal and concrete experiences of human rights violations, the processes and consequences of non-applications of human rights can be both taught and learnt. Exploring personal experiences of the realisation and non-realisation of human rights opens up possibilities for teacher and learner to be received as a subject and not an object, and ultimately to be cared for as someone with equal dignity and worth (Noddings, 2007). Human rights literacy could aid rights-based education and transformative action towards an open and democratic society, if it moves away from teaching-learning knowledge about human rights, towards acting collectively in solidarity with the marginalised towards a humane society through humanising educational practise (see Bajaj, 2011; Freire, 1993). Within the South African context, education as a transformative humanising practice of freedom ought to focus on teaching-learning, towards a sense of critical consciousness shared by both teachers and children, resulting in the humanisation and transformation of the world they share (Freire, 1993). Human Rights Education for Transformative Action within a "struggle approach" (Heyns, 2006:3) could aid both the processes of facilitating human rights literacy in teacher training and in teaching-learning, as student teachers will implement their understandings of dignity, equality and freedom in rights-based education. To reach this aim, tertiary institutions need to facilitate human rights literacy as involving understandings of dignity, equality and freedom as both rights (legal claims) and values (normative relations), with horizontal and vertical applications, within the South African socio-political and economic context. This would include knowledge about human rights and understandings of the processes, namely the influence of power relations, historic and on-going poverty and marginalisation on vertical and horizontal applications and the consequences of human rights in terms of the (non)realisation of equality, dignity and freedom. To this end, working actively from a "struggle approach" (Heyns, 2006:3) towards humanising and understanding human rights within a common human ontology by means of Human Rights Education for Transformative Action, will not only afford student-teachers the opportunity to question marginalisation as a social construct, but likewise with the opportunity to conceive their own responsibility in reconstructing and humanising society (Dale & Hyslop-Margison, 2010). The research embodied in this article has been conducted within the realm of a research project funded by the National Research Foundation of South Africa. The authors wish to acknowledge and thank the Human Rights Literacy research team for collaboration in planning and conducting the research. i. Yacoob made this statement during his keynote address at the Annual North-West University Human Rights Conference in Vanderbijlpark in 2014. See also S v. Makwanyane 1995 (3) SA 391 (CC) para 230 and 305, where it is noted that constitutional rights are for the protection of everyone, including the "weak, poor and vulnerable". ii. The South African Schools Act, No 84 (RSA, 1996c), the National Education Policy Act 1996, Act No. 27 of 1996 (RSA, 1996b), White Paper 6 on Inclusive Education (DoE, 2001a), the Manifesto on Values, Education and Democracy (DoE, 2001b), the Guidelines for Inclusive Learning Programmes (DoE, RSA, 2005), the Strategy for Racial Integration (DoE, RSA, 2006) and the Bill of Responsibilities for the Youth of South Africa (DoE, RSA, 2008). iii. The restructuring of higher education in 2001-2007 aimed to break down apartheid's racial divides, unifying the fragmented systems inherited from the previous dispensation, and eradicating the in equalities and distortions of the inherited systems (Wyngaard & Kapp, 2004). In terms of organisational culture and ethos, the former 'white' universities were perceived as elitist and colonial, while their merger partners were regarded as a place of teaching and learning for the historically disadvantaged - often associated with political and economic oppression. iv. The term ubuntu is a Southern African concept that refers to 'human-ness', translated as 'humanity towards others' and relating to a belief that all humanity is connected by a universal bond. Also translated as 'people are people through other people' (Nguni) or, from an isiXhosa proverb:''umuntungumuntungabantu' as 'a person is a person through his/her relationship with others'. See Gade (2011:303-322) for a historical development of written discourses on Ubuntu. v. Verbatim quotation was edited for the publication. vi. Verbatim quotation was edited for the publication. vii. Verbatim quotation was edited for the publication. viii. Verbatim quotation was edited for the publication. ix. Verbatim quotation was edited for the publication. Prinsloo v. Van der Linde 1997 (3) SA 1012 (CC). S v. Mhlungu 1995 (3) SA 391 (CC). The President of the Republic of South Africa v. Hugo 1997 (4) SA 1 (CC) para 41.